The Mele A210 is a cheap A10s based TV puck. The device has a sticker on the bottom of the exterior where it is clearly marked as MELE and (Model): A210. MELE A200 single core version's board (with a LAN port) has exactly the same mark. For building u-boot, use the "Mele_A210" target. While you could use the UART to trigger FEL mode, there is little point in it as you'd probably first need to solder on a port to get USB OTG out of this device. There are four screws underneath the rubber feet at the bottom. Remove them, and your device will open. 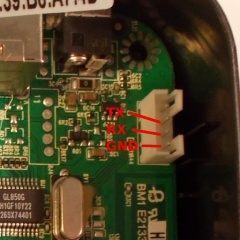 The Mele A210 has a 4 pin 2.0 pitch JST-PH connector for its UART. This is the same as some 90s analog audio cables which ran from a CDROM to the sound card. Wire things up according to our UART howto. This page was last modified on 14 July 2015, at 23:37.